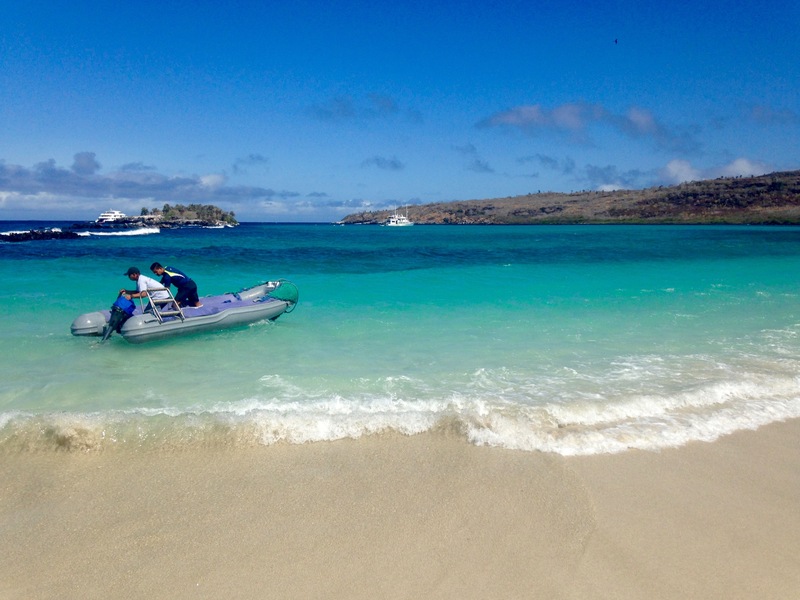 The Galapagos islands are perhaps the most famous field study location in the history of science. What had been regarded as a few barren, unproductive rocks since their discovery by the Spanish in the 16th century became Charles Darwin’s living laboratory, where he collected the data necessary to form his theory of evolution by natural selection. That data, of course, derived from the unique, endemic wildlife that developed in the Galapagos, both as a result of the archipelago’s isolation from the mainland, and of individual islands’ isolation from each other. Today, the chance to see these animals forms the basis of a thriving ecotourism industry. The environmental regulations that Ecuador has imposed on the tourist industry in the Galapagos islands are the most stringent I have ever seen, but that’s a good thing. Tourists must go through a customs inspection and are issued a $100 immigration card, as if the Galapagos was a nation unto itself. Many islands can only be visited while accompanied by a licensed guide on a sanctioned cruise, limited to 16 tourists at a time, and even then only a tiny part of each island can be walked upon, with no venturing outside the trail. The various cruise operators coordinate so that their passengers don’t crowd the same locations at once. I was fortunate enough to sail with one of these cruises, visiting ten islands over eight days, while snorkeling in the ocean around these islands almost every day of the cruise. Both on land and in the water, it was immediately clear why there is so much environmental regulation. 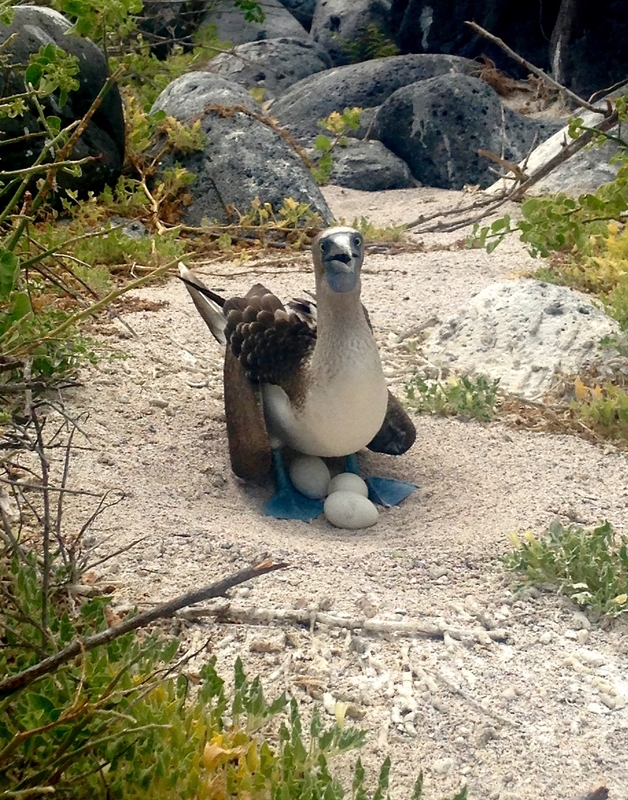 Birds, such as the famous Blue-Footed Booby, laid their eggs in shallow sand pits on the ground, having no fear of predators like rats and snakes. Sea lions swam circles around us, seeing humans as playmates rather than threats. Masses of amphibious iguanas crawled past our feet, so close that one had to be careful not to step on them. This is a fragile environment that is easily damaged by aggressive invasive species, (including humans!) and Ecuador is doing what it can to protect the islands’ ecosystem. This Blue-footed Booby has no need for a tree nest. And what an odd ecosystem it is. The plants and animals of the Galapagos are evolved from whatever happened to float by – literally. The islands are located at a crossroads of ocean currents, which arrive from the north, south, and west. It’s theorized that tropical species, like iguanas and tortoises, arrived as castaways on driftwood from the northern current, before diversifying into the various reptiles on the islands today. The most important current, the Humboldt, flows from the south, bringing cold water and nutrients from Antarctica. This cold water allows penguins to survive in the Galapagos, despite their equatorial location. Interestingly, one of the greatest threats to Galapagos wildlife is a result of natural causes. The El Niño phenomenon slows down the flow of the Humboldt current, allowing for warmer water, clearer skies, and calmer seas. This is nice for tourists, but can be catastrophic for the animals that depend on it for nutrients, which work their way up the food chain – from algae, to fish, to sea lion, for example. While El Niño is a natural climatic phenomenon, its warming effects may well be magnified by the rising sea temperatures caused by climate change. There is a particularly strong El Niño at the moment, and I saw a few instances of animals which may have been in distress for lack of food, such as a beach full of sea lions with wailing babies and indignant mothers. They could have been upset for some reason other than hunger, of course, but it’s hard to imagine an unhappy sea lion with a full belly. The sea lions, another endemic Galapagos species, (more closely related to their California cousins than South American sea lions) were the spirit animals of the cruise. They were present on every island, and when not asleep, they could be seen clumsily bumping into each other or arguing with belch-like barks. Underwater, it was a completely different story. They moved with almost unbelievable speed and grace. We snorkeled past a group of Galapagos sea lions at the edge of a lagoon on the island of Santa Fe. The Santa Fe lagoon. Our boat, the Fragata, is in the middle distance. Bartolome is a newly created volcanic island off of the larger Santiago. In the channel between them, a sea lion jetted in loops around us. Another lazed on the surface while colorful tropical fish swam amongst the rocks below. Your author at the highest point on Bartolome. Part of the video above was taken swimming around that pinnacle of lava to the right of this photo. Besides sea lions, we saw schools of tropical fish swarm around the volcanic outcroppings throughout the archipelago, along with sea turtles and sharks. One morning at a famous dive spot, Kicker Rock, three different species of sharks could be spotted – white tip, black tip, and endemic Galapagos sharks. A school of three of this latter type led us to a much larger group of sharks – twenty or more! Devil’s Crown is one of the most famous dive sites in all of the Galapagos Islands. This slowly sinking pillar of lava rock off the coast of Floreana was home to a greater volume and variety of fish than anywhere else we visited. A marine creature that didn’t make it. Here’s the spinal column of a whale. Not sure of this fish species, but schools of them were everywhere. Sea turtles were a more common sight than their giant land-dwelling cousins. The famous Blue-Footed Booby was just one of many Galapagos birds we saw nesting, courting, and flying – often within reaching distance to us. A host of reptiles crawled, slithered, and swam both on land and in the sea. 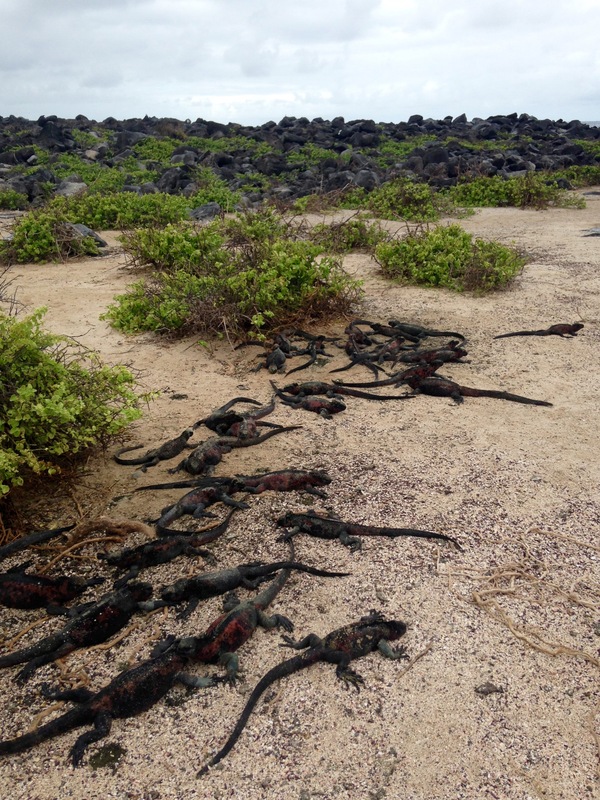 There were several species of both land and marine iguanas, as well as lava lizards. The latter of these were small and fast, but they had so little fear of people that it was possible to get some close-up, sharp shots of them. How could I forget the Galapagos’ most famous residents, giant tortoises?! We didn’t exactly see them in the wild, but at a free-range turtle ranch in the forest, we witnessed the slowest fight of all time between two male tortoises. So slow, in fact, that one of the participants didn’t even seem to notice he was being attacked. There’s nowhere else on earth like the Galapagos Islands. It’s a unique, vulnerable environment that is still threatened by human activities, but I was very pleased to see that the Ecuadorean park service is admirably vigilant in protecting it. Hopefully the ecosystem will still be in great shape when I return – after all, I only saw the eastern islands. The western half of this incredible archipelago still awaits.